It was almost surreal at the start of the Real Berlin Marathon. With over 40,000 runners at the start, one runner was standing ahead of the starting-line tying his shoes. With everyone else in place, Haile Gebreselassie finally moved to the line just seconds ahead of the gun. It was almost as if the race was being hosted as a showcase for the talent of this one man. In fact, it would turn out to be his day. Under perfect conditions, Gebreselassie and five pacers set off this morning, hitting their world record pace target from the gun with a an opening 2:57 kilometer. Gebreselassie was dressed in a bright red singlet. Four of his pacers wore white, the fifth in a bright neon yellow top. The pacers formed a pack around Gebreselassie, moving him quickly ahead of the pack, eventually pulling him almost one minute and 20 seconds ahead of the next closest runners. The large chase pack, with several pacers of its own, was storming along behind Gebreselassie at an incredible pace of its own. For most of the early miles, they were on keeping to 2:06:00 pace, faster than most would be able to handle, but enough to keep a few of the top runners close. Abel Kirui of Kenya would eventually finish with a personal best time of 2:06:51, four minutes faster than is former perosnal best, to claim second place. Gebreselassie displayed incredible poise, using his pace setters to calmly run through the first half of the race in 62:29, well ahead of world record tempo. The small pack of six runners navigated the Belin streets like a well coordinated machine, sticking right to a blue line painted on the road to show the best course. Gebreselassie’s pace makers began dropping off at the half-way mark, where he shed two of them. The remaining pace makers (Rop, Wandimu and Limo), were led by the very strong Rogers Rop through 30KM. At the 30KM mark, the last two pacers dropped away and Haile Gebreselassie was on his own. Although it appeared the Gebreselassie may have been slowing after the departure of his pacers at 30KM, it was a short-lived break. He picked the pace back up just prior to the 35KM mark and had lost no ground. With the closest three runners behind him pulling him back slightly, Gebreselassie found his groove and kept the pressure on, building his speed into the last section of the race. After slipping slightly behind world record pace to 2:05:10 pace at the 30KM mark, Gebreselassie pulled himself 29 seconds ahead of world recrod pace and kept that difference at each of the time checks at 35KM, 40KM and into the finish. As he approached the end of the race, it became clear that his pace was not declining. In fact, he seemed to be accelerating as he sailed through the Brandenberg Gate, with the massive crowds roaring their approval of his efforts. As he approached the line in his bright red jersey, Gebreselassie had a smile plastered from ear to ear and then raised his arms overhead in celebration. Gebreselassie had not made a prediction of his pace ahead of the race, but he had hinted to reporters that he wanted to break 2:04:00. Although he didn’t quite reach that mark today, it looked as though he was completely within himself throughout this race and that he may have plenty more speed to break even this new world record in upcoming races. He has declared his intention to try again in Dubai and then plans to run in the Beijing Olympics next Summer. Gebreselassie’s new world mark is simply amazing to comprehend. Shaving 29 seconds off of a record that has been in place since 2003 is incredible. This amounts to a difference of more than one second per mile over the entire distance of the race. In achieving this milestone, Gebreselassie has cemented himself again as the greatest distance runner of our time. 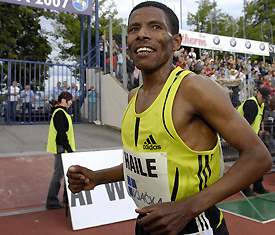 Comparing his race today to Paul Tergat’s 2003 performance, Gebreselassie was 32 seconds ahead at the half-marathon mark and 29 seconds ahead at the finish. Tergat ran a negative split in his 2003 race, blistering the last 2 KM, but Gebreselassie did the same today after a faster opening half. Tergat ran 63:01 in the first half and 61:54 in the second in 2003. Gebreselassie ran 62:29 and 61:57 today. With the focus so squarely on the new world record, it could be easy to overlook other great performances in Berlin today. Abel Kirui of Kenya finished second in a blistering 2:06:51, just ahead of Salim Kipsang in 2:07:29. In the women’s race, Gete Wami simply crushed her competition, running through the half-marathon in 1:10:25 (2:21:00 pace). She went on to finish in 2:23:17, with a very strong finish. She plans to race again at the ING New York City Marathon in just a few weeks. The television coverage of the marathon was excellent. You can watch the entire race on-demand at WCSN.com. For more information check out my earlier post that includes the rates for subscription packages. This was simply an incredible day for marathon running! It will be amazing to see what Haile does next. Commentary: what does a marathon world record really mean? Running Wild is a free column from runners and triathletes with new content posted every day. Come on back and visit us often. Running Wild with Coach Joe – a blog focused on marathon, triathlon and ultra-endurance racing, training and motivation. Bookmark us at http://distance-running.com or use your favorite RSS feed reader to get the latest news and articles. Running Wild is also now available on Facebook and My Space. « Berlin Marathon: New World Record! Thanks for the great race report for those of us who didn’t subscribe to the WCSN coverage. This is better and faster than the major news outlets. You’re welcome Doug. With a one week old baby in the house, I’m up anyway! This was the most exciting race that I’ve watched in a long time. It was text-book. Simply incredible.